uuid : 8e79c4f0-ffa0-474f-9d92-f9a0db0ee0f7 templates_id: 119468 templates_uuid: "f6a0ee56-9d12-4c38-a8d8-6fe6b56b7b41" title: "Letter Assigning a Contract - Deed of Assignment of Contract" display_name: "Letter assigning a contract" meta_keywords: "Deed of assignment" description: "
Guarantee a straightforward transfer of rights and benefits from one contracting party to another with this letter assigning a contract. 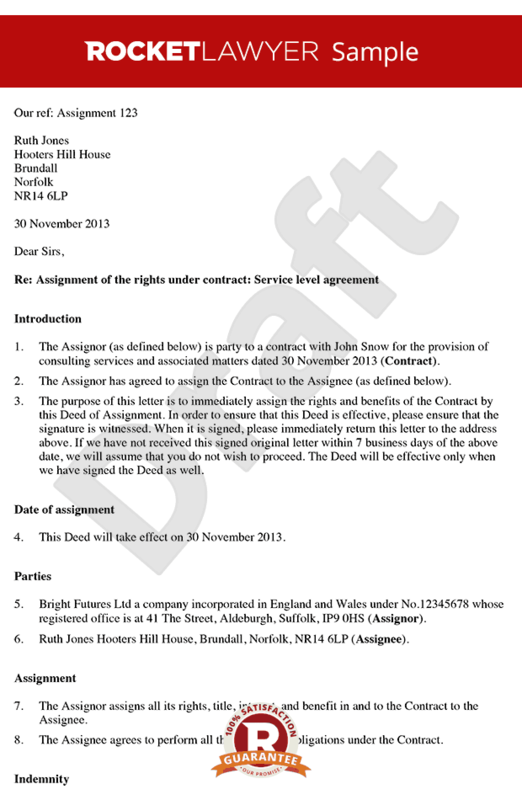 This contract assignment letter can be used to alter the parties to a contract or to transfer your rights to someone else or to another organisation. Your notice of assignment of contract will include a detailed list of what is being transferred as well as an agreement by the involved parties to assist each other in the transfer. What is a letter assigning a contract? There may be situations where one party wishes to leave a contract and transfer their role to a new, incoming party. Transferring a contract from one party to another is known as \302\221assigning\302\222 a contract. A letter of assignment is the letter by which a party to a contract transfers their rights under the contract to a new party. Why do I need a letter assigning a contract? A letter assigning a contract can help ensure a straightforward transfer of rights and benefits from one contracting party to another. This is the party assigning the contract to another business or person and so leaving the contract. This is the new party to a contract, replacing the assignor. Who is the other party to a contract? This is the party with whom the assignor has a contract and who will be remaining in the contract. What should be included in a letter assigning a contract? You should include a detailed list of what is being transferred as well as an agreement by the involved parties to assist each other in the transfer. An assignment of contract only transfers the benefits of a contract, not the obligations of the leaving party. However, in practice, the letter of assignment will usually contain a subcontracting clause, whereby the assignor subcontracts, or delegates, their obligations under the contract to the assignee. This is the date on which the assignment of the contract will take place. Ideally this should be a date in the future allowing for the document to be signed by both parties. Who is liable if things go wrong? As opposed to a novation agreement - which transfers both the benefits and the obligations of a contract to a third party - an assignment does not transfer the burden of a contract. This means the leaving party remains liable for any past liabilities incurred before the assignment. You can include an indemnity (or guarantee) in the letter assigning a contract from the new party that they will pay the leaving party if it suffers any loss from problems caused by the new party. What do I need to check in the original contract? allows either party to assign to any new (third) party whenever they wish. Who should the letter be sent to? The signed letter of assignment should be sent to all existing parties. Stakeholders, such as banks or customers, should be notified of the change. This letter assigning a contract is governed by the law of England and Wales.
" created_timestamp: "2018-10-08 04:36:10.0" modified_timestamp: "2018-10-08 04:36:10.0" active: true created_by: 104 modified_by: 104 dcm_id: 270 url_slug: "Letter-assigning-a-contract" meta_description: "Prepare a letter assigning a contract to transfer a contract from one party to another. Let Rocket Lawyer ensure that your assignment contract covers all the rights and responsibilities you wish to transfer. Try this free contract assignment letter." time_to_complete: "15 minutes" role1: "Assignor" role2: "Assignee"
There may be situations where one party wishes to leave a contract and transfer their role to a new, incoming party. Transferring a contract from one party to another is known as assigning a contract. A letter of assignment is the letter by which a party to a contract transfers their rights under the contract to a new party. More than just a Letter assigning a contract template, our step-by-step interview and guidance makes it easy to create your document. Easily create online, download, print and sign your free Letter assigning a contract in minutes. This document is also sometimes called: Deed of assignment.